FuelCubes, TransCubes and Abbi Mobile Refuelers are a reputable line of transportable and environmentally friendly double-walled fuel storage tanks. These efficient fuel storage solutions are ideal for onsite fueling and auxiliary fuel supply. Fully approved for transport when full, the Abbi fuel storage tanks are well suited as a mobile refueler, traversing around jobsites to quickly refuel construction machinery or auxiliary equipment onsite. It can be supplied as a standby tank and a mobile refueler, offering both applications as one unit. The TransCube is an efficient solution to fuel up to three pieces of construction machinery simultaneously. It boasts a a fully transportable design and will save you time and can double or triple the run times of your equipment. For logistically challenging sites that require fuel, the TransCube can be safely lifted by crane or forklifted precisely and quickly. The FuelCube can connect to one diesel powered piece of equipment and dispense fuel by pump at the same time and includes features such as an integral, lockable equipment cabinet for security and 4-way forklift pockets for easy mobility when empty. Ideal for both remote locations as well as for placement on your facility, the FuelCube can be fitted to refuel your fleet and reduce any unneeded downtime. Fluidall’s all-in-one oil filtration solution is built on a portable cart with casters with self-containment; it is configured with high-capacity filtration and stores bulk fluids up to 110 gallons. 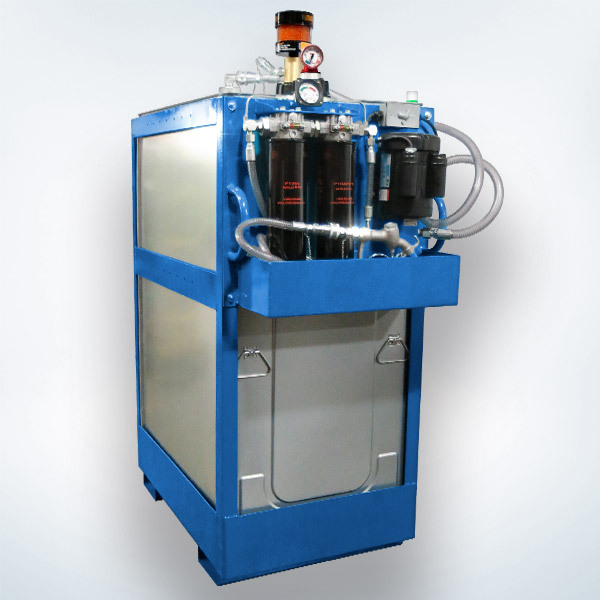 Our new filtration system can draw oils from external sources and transfer fluids for point-of-use filtration, top-offs, and fluid change-overs. Filtration reduces operating costs, maintains clean and dry fluids, minimizes wear on gears and o-rings, and extends the life of lubricants. During the month of May, 2014, Fluidall is offering an exclusive discount of $500 off our recently introduced 110 Gallon Portable Filtration Package, as displayed at the Reliable Plant Expo in San Antonio, TX during April. Mention promo code RP0514 at time of order to receive a $500.00 discount. Sale on Packaged 110 Gallon Double Wall Tank with Castered Steel Cart and Filtration Panel Unit only. No other discounts apply. Discount does not apply to previously placed orders. $500 off sale ends May 31st, 2014 EOB. As the industry leading manufacturer of stackable tanks, Fluidall is excited to expand our fluid storage and handling line to include double walled tanks which will increase our customer’s efficiency and profitability for storage of Class II and Class III fluids. Our double wall tanks will offer producers important operational advantages, providing our customers with extended fluid storage and handling abilities. Implementing double wall tanks is far more simple than dealing with oil drums. Our tanks are easy to dispense from, monitor accurate fluid levels meter and are environmentally safe. The tanks eliminate the needs for additional secondary containment. The steel outer tank acts as the secondary containment, offering maximum protection from leaks and spills. Our double wall tanks are reusable, compact and economical. Double Wall Tanks are available in 110, 165, 275 and 400 gallon capacities. Each tank can be purchased individually or packaged, with an optional leak alarm, fluid level gauge and lockable fill cap with vent, Graco pump package with 50’ reel and air filter regulator, and with a preset or non-preset meter. In stock, and ready to ship, the tanks will be delivered quickly and efficiently to our dealers, distributors and their customers across the country. For more information about the tanks, visit our Roth Double Wall Tanks product page or request a quote. All poly storage tanks manufactured and sold by FLUIDALL are DEF ready, including our bulk stackable tanks and portable storage systems. Our DEF dispensing systems are complete with an array of poly tank sizes, tank stands, closed coupling systems and several air operated pump systems. Lower your costs with bulk delivery. Station your DEF bulk with a central storage tank, then add a portable DEF tank up to 120 Gallons. More options and sizes for DEF tank storage systems and DEF equipment. Sign Up for ‘Insider’ Product Specs & Promotions! Unsubscribe anytime.